Sure, 3D printing has brought us a ton of cool creations and unique ideas (can we just go back to the whole 3D-printed Aston Martin thing? ), but did you know it can save you a trip to the store when you’re in a pinch? If you have access to a desktop 3D printer, you might be able to save yourself a little time and money by printing some useful household items. We’re not talking about baubles and knicknacks here either, these are items that actually serve a purpose. All your forks are in the dishwasher and you can’t wait until they’re clean? Bam! Print yo’ self a new one! Bought a new shirt but don’t have an extra hanger? 3D-print that sucker. Booyah! The best part? You don’t have to have a mass of 3D or technical prowess to create these objects. Everything on this list can be downloaded directly to your PC and sent to your 3D printer. Plus, when Windows 8.1 is released this fall, you’ll be able to 3D print things straight from your desktop, since Windows 8.1 will include native support for 3D printing through built-in APIs. But you can get started on these even before Windows 8.1 is available. All you need is the plastic and the printer itself. Leave the heavy thinking to the designers; all you’re looking for is functionality (and maybe a little artistic flair), and that’s definitely what you’ll get with these 3D printables. You may never have to take a trip to Target again! How many times have you gone on a shopping spree, only to return home and realize you don’t have enough clothes hangers to accommodate your new ensembles? Okay, so maybe this is a problem that only plagues people who run out and buy a new outfit each week, but still, we’re sure there’ve been times when you needed a hanger and couldn’t find one. Don’t bother running out to the store, though; simply download the Parametric Coat Hanger from Thingiverse user Jsadusk, and you’ve got a fully functional hanger. This hanger comes in two pieces (since some desktop 3D printers may not be big enough to print one solid piece) and snaps together. It’s quick, easy, and a great solution to a practical problem. You pay good money for the toothpaste, why shouldn’t you be able to use every last drop of it? We’re sure we’re not the only ones who are frustrated with how difficult it is to squeeze toothpaste out of those cents-stealing tubes sometimes. Fortunately, this issue is easily remedied. Enter the Paste Pusher by Thingiverse user Makeplace. Sure, the design is a little juvenile, but most of us are still kid’s at heart, right? This tool prints quickly, and the funky design doesn’t take away from the fact that this product is very useful. A broken shower head can be one of the worst household problems. You’re tired from a long day at work, you’re dirty from a lengthy jog, and all you want to do is clean up and relax. You head into the bathroom and turn on your shower only to find it not functioning. Nightmare scenario, right? Luckily, shower heads are now printable, too. The Shower Head MK1 design by Thingiverse user ErikJDurwoodII is perfect for when you need a new shower head and don’t want to bother with a trip to Home Depot. 3D printers are only limited by our imaginations, as evident by the creation of the Blossoming Lamp by Thingiverse user Emmett. This intricate looking household item is as much a work of art as it is a functional lighting source. The Blossoming Lamp isn’t something you print quickly, however; it’s more something you print when you want to make a statement with your home design. The lamp itself physically blossoms, opening and closing with simple pushing and pulling motions near the top of the object. The beauty here is that this is all printed to work this way, with no assembly required. If you’re looking for a clever and creative way to bring more lighting into your home, be sure to grab the Blossoming Lamp. Check it out in action below. This is easily one of the most useful 3D printable items to hit Thingverse. The Finger Fork by Jckarich is one of the quickest and easiest solutions to an issue that plagues us all: how to get food into our mouths. In all seriousness though, how many times have you gone camping or took a sack lunch to the park and completely forgot silverware? The finger fork slips onto the end of your finger, meaning you won’t have to grip it to use it. 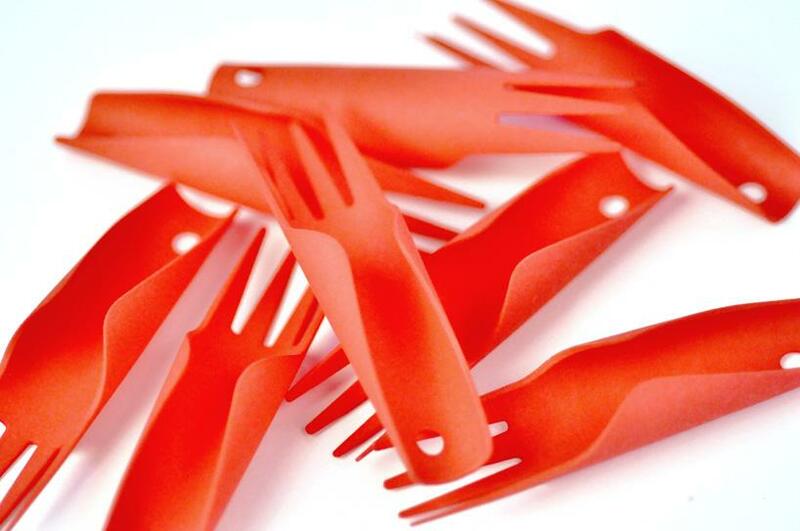 Better yet, you can even stack these little marvels together to make an even larger fork. It’s a super simplistic design, which makes it perfect for quick 3D printing. So you’ve got your fork, but how about cracking open that beer bottle – uh, we mean soda pop – while you’re picnicking in the park? Why just break out a normal opener when you can spice up the party with Domo, the official mascot of Japan’s NHK television station? 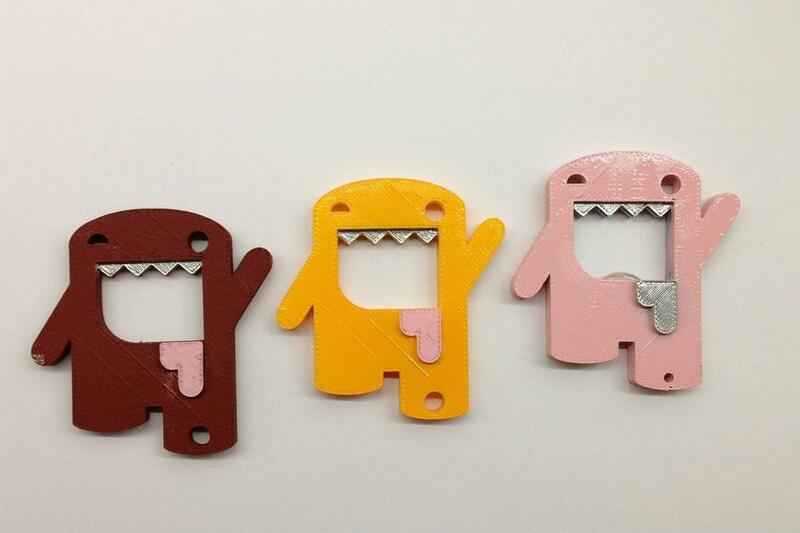 The Drunk Domo Beer Bottle Opener from Thingiverse member Tachyio takes a creative twist on the traditional bottle opener. It features a slotted coin design which lets you insert a metal object for opening. This little character makes a great gift for all your beer drinking buddies. Now there is, thanks to Thingiverse user Pleppik. 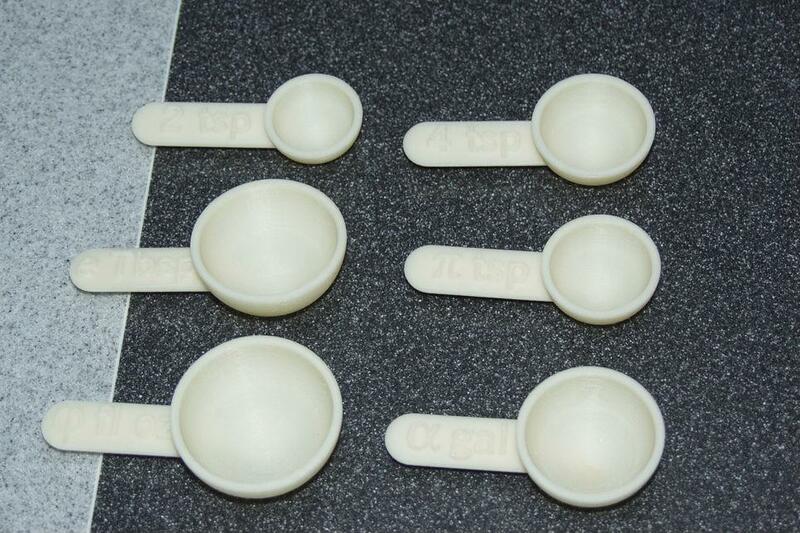 The measuring spoons, which the designer describes as being built in hard-to-find and useful sizes, are customizable. Once you have the blueprint, you can pretty much make any measurement you want. If you have a recipe that’s become a standard for you, we suggest making your own measuring spoons to save you some time. You’ve been printing a lot of things for yourself, but how about printing something for someone (or something) else – like the birds? 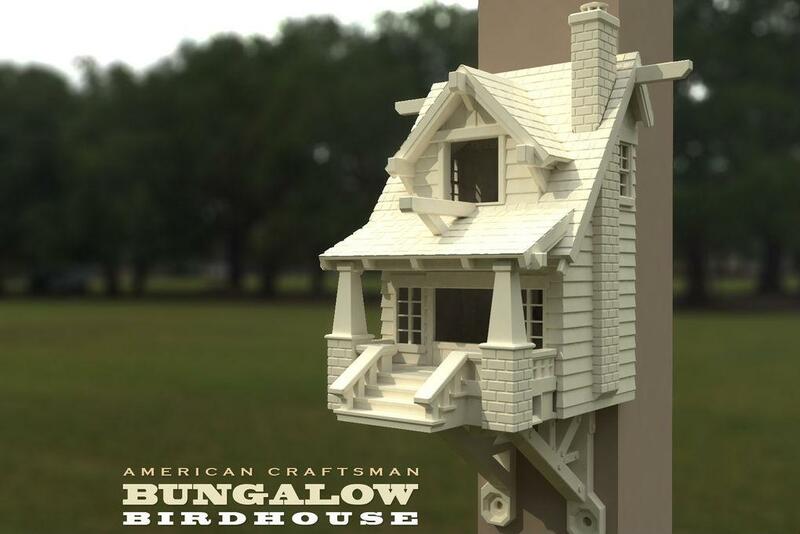 The American Craftsman Bungalow Birdhouse, created by ErikJDurwoodII, the artist behind the shower head above, looks great, comes complete with mounting brackets (that you print), and will bring all the birds to your yard – actually, on second thought, may not be the best thing after all. Great 3D printing projects are sometimes the product of people solving annoying issues in everyday life, and Thingiverse member Seth Moser’s custom coffee and tea sleeves is a perfect example. These printables are the solution to those annoying and flimsy cardboard sleeves that coffee shops give you to shield your hands from being burnt by cruel and unusually hot coffee. Unfortunately, the cardboard version is wasteful, and they slide off easily. Moser’s design is artistic, and it fits snug and secure. It can be printed in a variety of colors and can be twisted and contorted into custom patterns for a more personal touch. This is easily one of the cooler solutions we’ve seen come from 3D printing. Last on the list is a smart solution to a problem only understood by cherry lovers. You love the fruit but hate the little pit in the center, and you find yourself in a spitting match any time you want to enjoy a cherry. RockstarAlchemist decided to take matters into his or her own hands using a 3D printer to create a specialized tool that de-pits each cherry. This is a great object to print out and keep in your drawer, as you never know when that homemade cherry pie craving will strike. 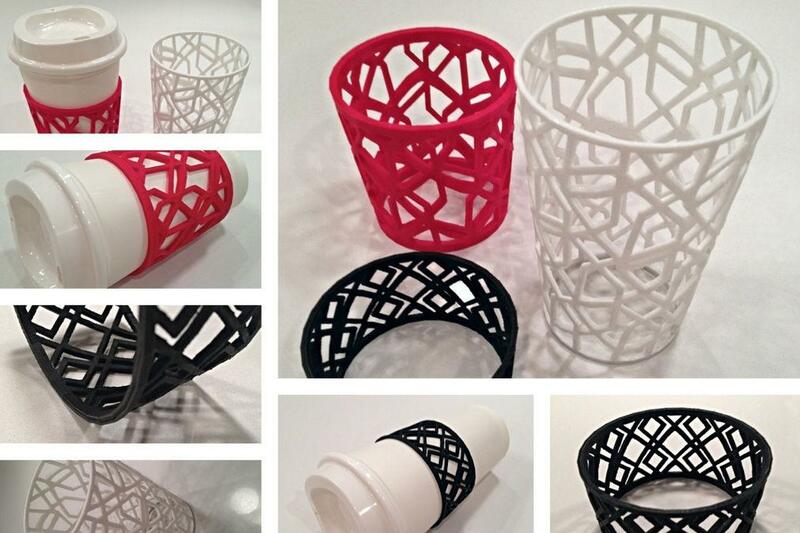 What do you think of our roundup of these cool 3D-printable home goods? Do you have any others you think belong on the list? Let us know in the comments below!